Weather, lighting, effects and immersion features. I have now retired from modding. Thank you to everybody who has supported and encouraged me. F3Project Reality MkI is now available! 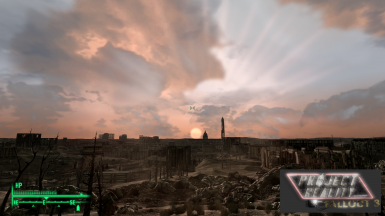 The inspiration behind this mod is to bring the real-world to Fallout, and to make our wasteland experience even more immersive. Project Reality MkI is initially a weather, lighting, visual effects and immersion features mod which was built using real world data. There is an option menu available in your pip-boy which allows you to define the mods settings. - Eye Adapt Effect which simulates the amount of light our eyes receive. - Indoor, outdoor weather and immersion sound effects. - Radioactive Rain with various levels of severity. Warning come via old air-raid sirens. - 'The Dark Wasteland'. The DC Bell tolls at midnight to usher in the dark. There are 3 levels of night to choose. I've began development of 'Project Reality: Tamriel Skies' for Skyrim. This will be a weather and lighting mod. Once I've completed that then it'll be full steam ahead finishing MkII. F3 Project Reality MkI requires the Fallout3 master file to work. The mod works with all DLC's. Compatible with all visual mods. Previous visual mod settings may have to be adapted as Project Reality re-designs the games base colours. It is not compatible with other weather mods. F3 Project Reality works beautifully with HDR or without HDR. Mod requires Archive Invalidation Invalidated. Extract the F3ProjectRealityMkI rar into your Fallout3 DATA folder and enable the mod. Delete the plugin. Also delete the F3NV folders in the texture/meshes and sound folders. Simple as that. I used GIMP 2.6, The GECK, FO3Edit and Sony Acid Pro 7 to make this mod.